In Chicago, community choice aggregation nosedived after initially saving electric customers millions of dollars. But in other Illinois cities, Ohio, and especially California, it’s thriving. Check out the whole story here. Boston’s City Council just took its first look at a plan that’ll shrink Boston’s carbon footprint and bring more renewable energy to every resident in the city. The April 25 session was remarkably successful: it drew most of the city’s councilors, over 80 supporters, and it took a deep dive into the sometimes puzzling details of Community Choice Energy. Blackmon Claim #1: Energy efficiency is the cheapest and cleanest way to cut GHG emissions. Investing any resources into CCE will be at the expense of energy efficiency. We agree: the cheapest and cleanest way to cut emissions is energy efficiency. Actually, BostonCAN worked on energy efficiency (aka weatherization) before the city created its efficiency program Renew Boston. But there’s no need to choose between efficiency and renewables. Efficiency alone won’t solve our climate crisis. We need new renewable capacity too. Blackmon Claim #2: Getting 5% more renewables, as other cities have done, would cost Boston ratepayers about $2.26 million above Eversource’s rate for Basic Service, whereas Renew Boston would save $400,000. Not so. The goal of CCE is to buy as much additional renewable energy as we can get without raising the price customers are paying for electricity. That’s a goal, not a guarantee, because we can’t predict whether Eversource’s rates will go up or down every 6 months. If the City thinks Eversource’s rates are going to drop, it can simply delay CCE implementation till the price picture looks better. If the City wants to expand Renew Boston, its representative on the state Energy Efficiency Advisory Council could support more money for weatherization instead of voting for the current three-year plan. Blackmon Claim #3: The proposal to buy Renewable Energy Certificates (RECs) would not actually bring new renewable power online or cut fossil fuel generation. Experts disagree. And the state has successfully used the purchasing of RECs to stimulate the conversion of fossil fuel generation to renewable power generation since 2003. Massachusetts law says utilities have to buy a set percent of all their electricity from new renewable generators located in New England (known as “Class I RECs”). In 2017, we’re at 12 percent. When you buy RECs, you are competing against the utilities for ownership of those certificates. Every REC that a city buys is not available to the utilities to meet their state-required purchases. The utilities have to sign contracts with other REC producers. Developers and financiers build more windmills and solar farms to meet the demand. The city of Melrose and the town of Dedham launched community choice energy a couple of years ago. Other Massachusetts cities have jumped on the CCE bandwagon (i.e. Brookline, Arlington, Somerville, Sudbury, and Winchester) and we expect their REC purchases to support about 17 more wind turbines than required by state law. That’s a very significant expansion of our local renewable capacity. Boston can take it a big step further. Buying any energy that’s privately developed profits those developers. Buying fossil fuel power raises profits for the large corporations that own New England’s fossil fuel plants. Buying RECs means we shift dollars from fossil fuel plants to renewable energy projects. Blackmon Claim #5: More renewables would raise prices and MA electric prices are among the highest in the nation. CCE didn’t raise prices in Melrose and Dedham. Those two pioneering communities hired an energy broker who found cheaper power, then used those savings to buy Renewable Energy Certificates. Residents ended up getting 5% more renewable energy than their utility was providing, without paying more on their electric bills. Our goal is to do the same in Boston. As for the state’s high electric rates, one of primary reasons for this is that we have to import all of the fossil fuels we use to generate electricity. Because we have plenty of sun and wind locally, building more renewable capacity will eventually bring our rates down. It takes time and new investments to build the fossil fuel-free grid that we need, but someday, we won’t be paying fossil fuel corporations to frack gas and build new pipelines to get it here. We’ll be using free sunshine and wind. 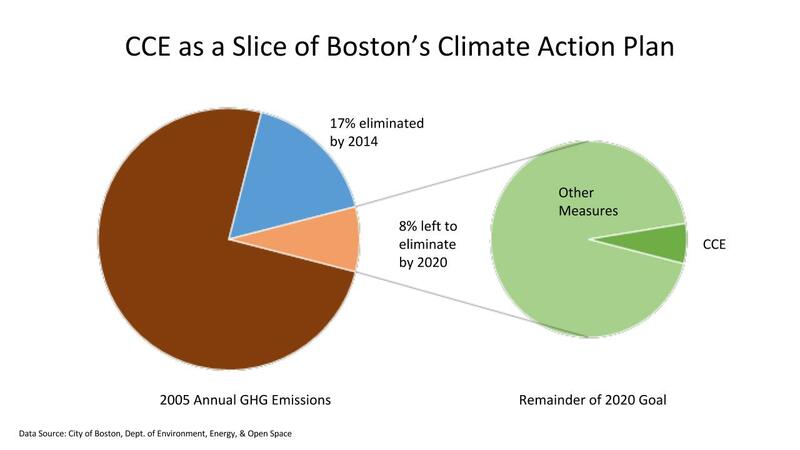 Blackmon Claim #6: About 28% of Boston’s customers have chosen competitive suppliers, and that weakens our ability to cut greenhouse gases via CCE. Yes, we’re not going to switch 100% of Boston’s energy consumption to renewable power this year. 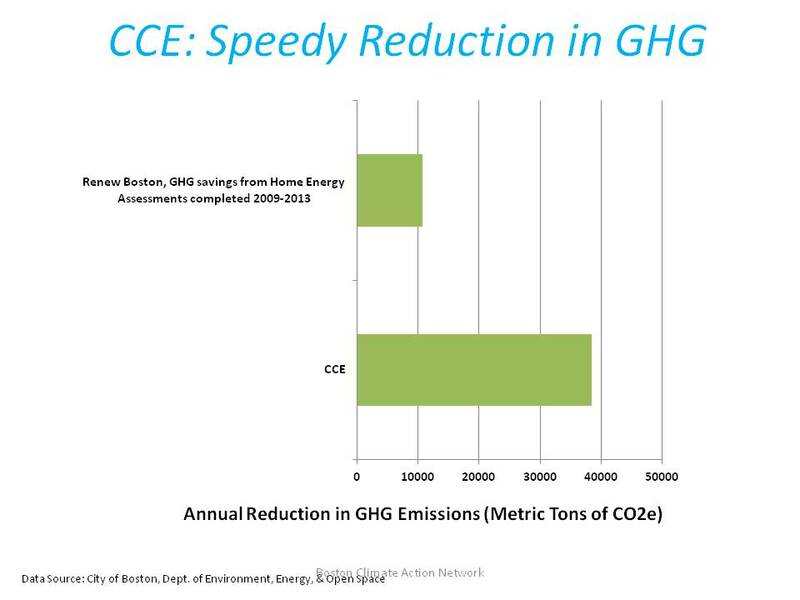 But if we switch the 125,000 Boston households and small businesses currently using Basic Service, we’ll immediately and significantly shrink Boston’s greenhouse gas profile, at a rate that far exceeds what energy efficiency through Renew Boston was able to achieve in its five most productive years. Blackmon Claim #7: Natural gas prices are probably coming down. So are prices for renewables. Natural gas produces greenhouse gases and other pollutants. Wind and solar do not. Buying more of them can help us achieve our greenhouse gas reduction goals. Blackmon Claim #8: Boston would need three to five full-time employees to administer a CCE program. Most Massachusetts cities and towns don’t do it that way. They hire energy brokers to go out in the market, find suppliers, and come back with a power purchasing plan. The city reviews the plan. Then the broker buys the energy, carries out a community education program to prepare for the transition, and handles any questions or complaints residents may have. The broker is paid a tiny percentage of the energy purchase. That costs the city nothing. All the city needs is a part-time staffer or consultant who selects the broker, evaluates the broker’s proposal, and keeps tabs on the project as it rolls out. Let’s bring clean power to EVERYONE in Boston! 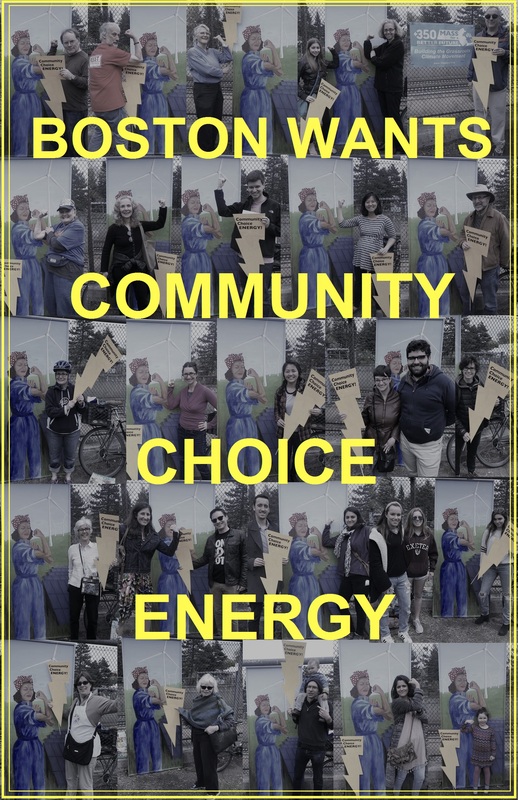 BostonCAN and the Green Justice Coalition are urging the City of Boston to adopt Community Choice Energy. This simple plan will bring clean energy to everyone in Boston, stabilize our electric bills, create good jobs, and bring down Boston’s greenhouse gases. Our goal is to deliver half again as much green power as Eversource does without raising our electric bills. And that green power would come from local sources, which means more jobs, fewer climate-changing gases, and more money staying in Massachusetts. There’s much more info on our new website. Please call your city councilors today. Come to the council’s first session at 3 pm Tuesday April 25. We are forming neighborhood climate action teams, and we meet alternate Thursdays at 6 pm, First Baptist Church, Jamaica Plain. Contact us and get involved! Community Choice Energy will help Boston reach its goal of cutting carbon emissions one-quarter by 2020, just three years from now.